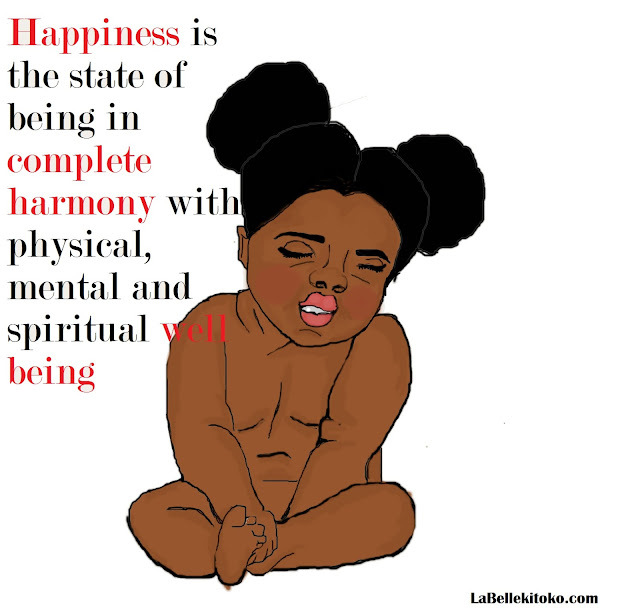 "Happiness is the state of being in complete harmony with physical, mental and spiritual well-being." If that definition is not correct to blame it on my physiology teacher "hehehe", no but at least I have to agree with him because that's what I feel when I'm happy. The first step to be happy is I guess wanting it. We all have heard it " happiness is a life choice ", you have to have the willing to simplify choices. What I mean by that is making choices that are simple to follow and stick with it. Don't complicate yourself because when you do so that's when you start hating life ( life gives you lemon well make it a lemonade ). To start to be happy you have to surround yourself with a positive attitude, atmosphere, and the most important great entourage. People around you, have to be positive in order to create that positive environment. You want love. Give love ( always) and receive love back in no matter what situation and for finding this great entourage of people that will give you that love back, is accepting each individual as they are and learn to like at least their bad behavior ( well if they can't change). Sleep at least 8 hours, it's only normal to be unhappy or grumpy when you feel like you have slept less than what you should. Makes plans for things, well not everything because you want to be surprised also. But when you make a plan over things you are more in control over what is happening in your life. Embrace new experiences, do something new or something "crazy" that you never did before and see if you like it! Give to others, I always feel like the more you give the more you get back. And the more you give you will feel free because less under your shoulder. Donate to people on the street, give to charity or even just cherish those you want to show love. So wasting time on people that don't love you!! you are given 24 hours to live every day, You really don't want to waste it on feeling without interest or reciprocity. Drink water, you will act crazy when you are thirsty, it's physiology fact! Learn to appreciate what you have already before to think of gaining something more. And the technique I use is thinking about death, it does help me to truly love whoever or whatever I have at the moment and show it, love. Have a good people around you, you want people that want to be your number one fan and support you in everything. Listen to Music that makes you happy and sing a lot. No matter how bad you sing be it has been proved scientifically that singing those help. And the triple L ( Love, Live, and Laugh) In fact Laugh a lot, laugh every day and always. Hi!Thanks for the comment in my blog!Well I totally agree with you,being happy is a state of mind as is impossible for everything to go always well,we have to be the one to take advantage of all the things that happen to us If they are good and also If they're bad. Hey Nancy that you so much for dropping by, we appreciate your support. And I like your blog vibe,great energy. Great post! I agree on learn to appreciate what you have. have a great weekend.